"You must never go near there." Happy Friday the 13th! 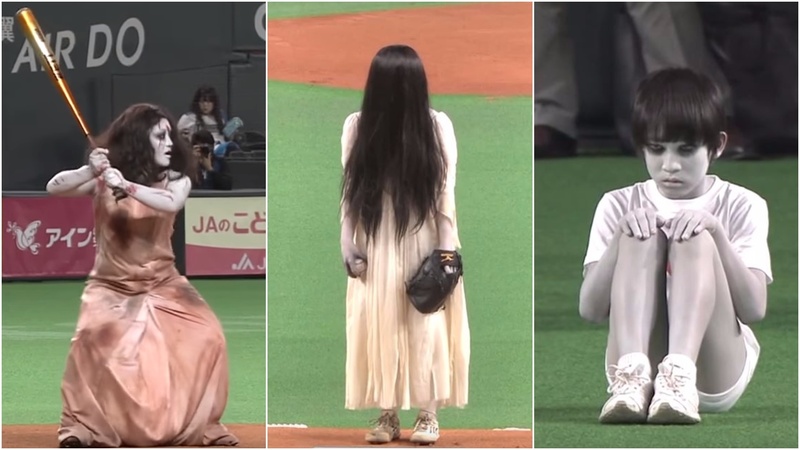 Celebrate the day with this trailer for Sadako vs Kayako, a Japanese horror mashup pitting the evil ghosts The Ring and Grudge series against each other. It was inevitable that one day we'd see these two long-black-haired evil spirits battling in the same movie, like how it was obvious one day they'd make Freddy vs Jason. And just like that movie, this seems to be pretty bad, despite their best efforts to make something fun. The cast includes Mizuki Yamamoto, Tina Tamashiro, Aimi Satsukawa, and Misato Tanaka. This looks very silly, but thankfully not as terrible as the Scary Movie spoofs, but I'm still not sure. The rock song they use in the trailer seems like an odd choice. A girl (Mizuki Yamamoto) after watching a cursed videotape together with her friend (Tina Tamashiro) in a haunted house, becomes trapped in a conflict between the two murderous ghosts: Sadako Yamamura (from the "Ringu" films) and Kayako Saeki (from the "Ju-On" films). Sadako vs Kayako is written and directed by veteran Japanese horror filmmaker Kôji Shiraishi, of the films Ju-Rei: The Uncanny, Dead Girl Walking, Noroi: The Curse, Ghost Zombie, Grotesque, Occult, Teketeke 1 & 2, Shirome, Chô Akunin, Cult, Foe 1 & 2, and A Record of Sweet Murderer previously. This horror film played at the Toronto Film Festival and Fantastic Fest last year, after first opening in Japan last June. Shudder will release Sadako vs Kayako direct to VOD starting January 26th this month. For more, visit their website. Anyone interested? Looks like a fantastic hot mess. Watching the Ring for the first time, not really knowing what to expect was quite a headmelt. Now the characters have been in everything it doesn't have the same impact. Then maybe a "cheesy" VS-movie is a pretty good way to do it? Yep, possibly. But speeding closer toward death, I'd rather watch something else.